Check back often for all the latest northern Indiana real estate news and statistics. Pre-qualification and pre-approval are not the same thing. A lot of times a buyer can phone up a lending Institution and simply by providing their debt, income, and assets, can have a pre-qualification letter generated… without any verification. Whereas a pre-approved buyer has formally applied for the loan. The lender has dug deep into their financial history. Credit checks have been run. And the lender has made what's called a “conditional commitment” to finance the purchase. So you tell me, who would you rather take your house off the market for? I know who I would choose. 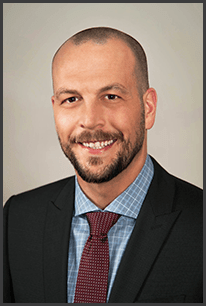 Hey, my name is Jason Patton and I'm the listing specialist with Berkshire Hathaway HomeServices, The Julie Hall Group. We help people buy and sell houses in Kosciusko and all the surrounding counties and we would love the opportunity to earn your business. please give us a call at 800-218-8195 or email us at sold@juliehallgroup.com. Thanks. I hope you found this information useful, and we hope to talk to you soon. The Julie Hall Group specializes in northern Indiana homes for sale. Call us today and let us know how we can help. STOP! If you're looking for Zillow Warsaw IN let me ask you one question... Why? This website is much more accurate and up-to-date than Zillow! CLICK HERE TO VIEW ALL WARSAW INDIANA REAL ESTATE FOR SALE. [VIDEO TRANSCRIPT] Okay, follow me. So you're in the market for a new house, you're in front of your computer and you're browsing Zillow, and, all of the sudden, you see this brand-new listing that you've never seen before. And in great, big letters, it says, "Pre-Foreclosure." So you get all excited because you see the word "foreclosure," and you click on the link, but there's no pricing information. So you get on your phone as quick as you can, and you call your realtor, and you say, "Jason, I just found this new listing on Zillow. What can you tell me about it?" And that's when I say, "Ryan, first of all, calm down. And second of all, I have no idea what you're talking about." I'm calling this video "Everything You'll Ever Need to Know About Zillow Pre-Foreclosures in 90 Seconds." Listen, Zillow pre-foreclosures are not for sale, at least not on the open market. All that that means is that the current homeowner has been served with what's called a notice of default notifying them of the bank's intentions to begin foreclosure proceedings, usually because of late payments, and it's just the beginning of a process that can literally take years. And the current homeowner still has the opportunity to make it right by catching up on their payments. So do yourself a favor and save yourself some headache and some heartache, and when you see Zillow pre-foreclosures, just ignore them. My name is Jason Patton. I'm the listing specialist and broker associate with Berkshire Hathaway HomeServices, the Julie Hall Group. We buy and sell houses in Kosciusko and all the surrounding counties. We specialize in Warsaw, Indiana waterfront homes for sale, nd I might be a little bit biased, but I like to think we're the best at what we do. Please give us a call at 800-218-8195 or email us at sold@juliehallgroup.com. Thanks, and we hope to hear from you soon. Should I Replace My Carpet to Sell My House? [VIDEO TRANSCRIPT] Hey, everybody. My name is Jason Patton. I'm a partner and the listing specialist here at Berkshire Hathaway HomeServices, and I wanted to take a second to talk to you about carpet. So one of the questions that comes up time and time again when we're on a listing consultation is, "Hey, you see our carpet over there? Should we replace that?" And that's a great question. And for the sake of this video, I wish that I had a boilerplate answer for you, but the truth of the matter is it just depends. So if your carpet was installed in 1974 and it's hunter green and THAT THICK, you're probably going to need to replace your carpet. Or if you own six dogs and a goat and they spend the majority of their time indoors, you're probably going to have to replace your carpet. Replacing your carpet is one of the easiest and most cost-effective ways to maximize the sale price of your home. But, that being said, it's not always necessary. If it's in relatively good shape and it doesn't stink, just have it professionally cleaned. Or if you don't want to mess with it at all, then just offer the buyer a carpet allowance. Look, like I said, my name is Jason Patton. We do a lot of business in northern Indiana, and, in the last two years, we've sold over 250 properties with sales volume totaling almost $40 million, and we would love the opportunity to sell your residential, commercial, or investment property for sale. Please give us a call. Our phone number is 800-218-8195. Or email us at sold@juliehallgroup.com. We would love to answer any questions you have, and we would love to earn your business. In the meantime, take a look at the Lake Wawasee homes for sale? The are beautiful and some of the best investment opportunities in Indiana. Video Transcription: The facts are all right here in black and white. Right now in this market, sellers are doing cartwheels and popping bottles of champagne while home buyers are literally screaming into their pillows out of frustration. But the good news is that spring has sprung, and there's no denying the fact that the housing market is in full swing. My name is Jason Patton, we are Realtors in Warsaw Indiana, and this is your Kosciusko County Market Minute for May of 2018. First, let's start off with some good news. 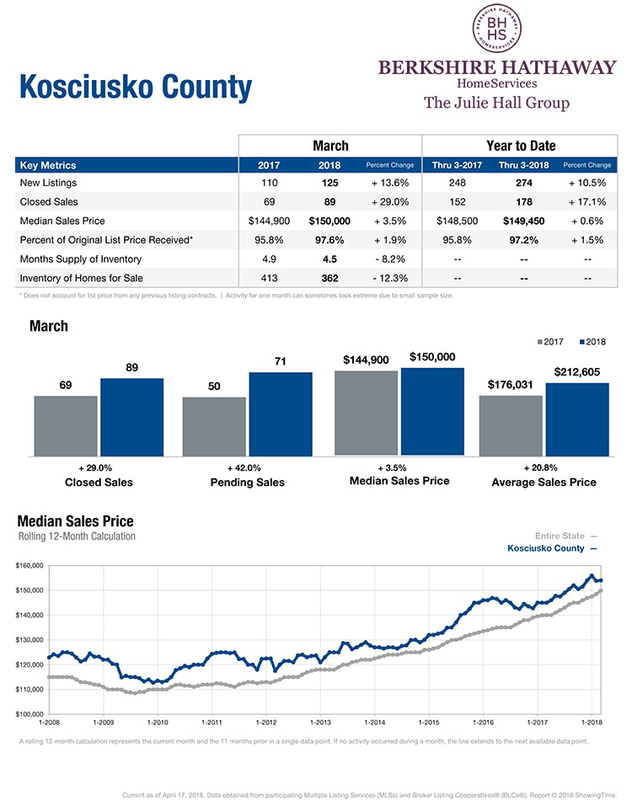 Last month in Kosciusko County, 125 new real estate listings came on the market. That's up 45% from the previous month, and it's up 14% year over year. Now, this sort of movement is typical for this time of year, and we expect to see this trend continue throughout the summer months. As far as closed sales are concerned, 89 Kosciusko County real estate transactions made it all the way to the closing table last month. That's up 79% from the previous month, and that's up 29% year over year. But again, this type of movement is fairly typical for Kosciusko County in the spring. Last month, the medium sale price for a home in Kosciusko County was $150,000. Now, that's up 16% from the previous month and it's up 3.5% year over year, but make no mistake. That number is most assuredly going to rise due in large part to the fact that some of these more expensive lake properties are going to start hitting the market. And now, let's talk about SUPPLY, which, in my opinion, is the most important metric to track when you're trying to take the temperature of the market. Supply is measured in months, and essentially what it means is if we keep selling homes at the rate that we've been selling them, how long until we run out of homes to sell? So it's been said that six months is a balanced market with no advantage to the seller or the buyer. Supply under six months is a seller's market, and supply over six months is a buyer's market. Well, let's take a look at where Kosciusko County was last month. So as you can see here, last month, across all price points, we ended up right at 4.5 months of supply, which is a modest seller's advantage. This number is up 2% from the previous month, but it's down 14% year over year. But here's the thing: This number is a little deceiving. Remember, I said that 4.5 months of supply was across all price points. So if you drop it down to houses available under $200,000, WE ONLY HAVE 2.2 months OF SUPPLY IN ALL OF KOSCIUSKO COUNTY. And you'll remember I said six months is a balanced market. 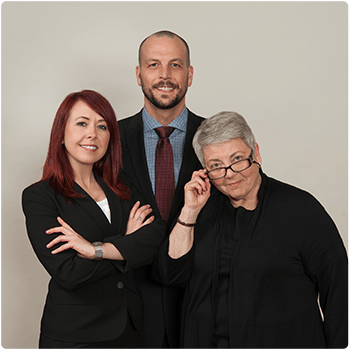 So we understand your frustration, and if you're one of those buyers who's banging their head against the wall because they can't find a house under $250,000 without somebody else writing an offer first, I have three pieces of advice for you. Number one, get pre-approved. Number two, be vigilant and set realistic expectations for how far your money will go in this market. And number three, hire a bulldog buyer's agent to work on your behalf. If you need a referral, we've got an excellent one on our team. Again, my name is Jason Patton. I'm the listing specialist and broker associate with Berkshire Hathaway HomeServices, the Julie Hall group. If you need anything, please give us a call. We cover all of Kosciusko County and right now there are some GREAT Syracuse Indiana real estate deals! Our number is 800-218-8195. Or email us at sold@juliehallgroup.com. Thank you so much. What in the World IS Earnest Money? These and other issues have the potential to arise if there isn’t a fail safe to ensure that a buyer is serious about purchasing a home. Once an offer has been made, and the purchase contract has been signed, the buyer will need to put money down to prove that he/she is serious. This money is referred to as earnest money or an Earnest Money Deposit. An Earnest Money Deposit is a way for a buyer to prove he or she is committed to following through with the agreements spelled out in the purchase contract. As mentioned earlier, this is considered separate from the down payment. An Earnest Money Deposit is usually paid by check and is written to the listing real estate brokerage. The money is held in escrow for the seller until the closing is finalized. How much money is considered acceptable? · Is there a high level of interest on the property from other buyers? · Is the property priced aggressively? · How quickly is the buyer able to close on the property? · How much less is the buyer’s offer compared to the seller’s asking price? · Is the property being financed or is the offer cash? If financed, what type? · Are there already multiple offers on the property? Industry experts have varying opinions on how much an Earnest Money Deposit should be, however, most recommend somewhere between 2-5% of the purchase price. Occasionally, sellers will disregard the percentage amount and ask for a fixed amount between $1,000 to $10,000. Legal limits vary from state to state regarding how much of a EMD is required/allowed. When a buyer provides little or no down payment (as is the case in certain VA and USDSA loans), a higher earnest deposit will usually be required to guarantee the buyer will follow through with their mortgage. A buyer can also increase their earnest money deposit in order to make their offer appear more attractive to the seller. Once received, the earnest money will be deposited into an escrow account owned by the listing real estate brokerage. That said, any check(s) must be written out to the listing real estate brokerage firm. Real Estate Brokerages are under strict regulations (state-by-state) that prohibit the Earnest Money Deposit from being deposited into a business account (commingling of funds). Instead, they are required to keep a separate account for funds in escrow. How to protect buyers and their Earnest Money Deposit? A buyer looking to close quickly should consider using a certified check for their Earnest Money Deposit. Is interest earned on an Earnest Money Deposit? When paying an Earnest Money Deposit, a buyer should remember that the money is deposited into an account and is considered an investment. Because the deposit is made in an escrow account, the deposit can earn interest. If the total equals more than $5,000 a buyer will need to complete the IRS Form W-9 in order to acquire the interest on their deposit. What happens to the deposit if the deal falls through? Occasionally, a sale will fall through. The buyer might not be able to secure a down payment or they find they're unable to qualify for a mortgage. Most often, after two parties have signed a purchase agreement the seller will remove the property from active status in the MLS. If the buyer is unable to continue with the deal, the seller has lost the opportunity to market their home to other potential buyer resulting in lost time and money. However, keep in mind when this happens the buyer has most likely already paid for inspections and an appraisal so they are out time and money as well. For the most part, the only time a seller has a clear-cut path to LEGALLY keep an Earnest Money Deposit is if the buyer 1) gets cold feet and tries to back out of the contract due to buyer’s remorse, or 2) fails to cooperate with their own lender in such a way as to purposely harm the transaction. Typically, if something happens early on in the purchase process, a seller will give up their claim to the earnest money deposit and return it to the buyer. In doing so, the seller is able to expedite the process of re-listing their home on the MLS. Unfortunately, emotions can sometimes become involved and a peaceful solution is no longer possible. In the event both buyer and seller fail to concede the EMD, the agents representing both sides will attempt to arbitrate on behalf of their clients. If an agreement still can’t be reached, the holder of the funds (listing brokerage) will initial the “release process.” At this time the listing principal broker will notify all involved parties by certified mail of the brokerage’s “intent to distribute” the funds to the party specified in the letter. If neither the seller nor the buyer initiates litigation or enters into a mutual release with 60 days of the date the certified letter was sent, the broker can then release the EMD to the party specified the certified letter. What is the most important aspect of the earnest money deposit? Many buyers are under the impression that the earnest money is an additional cost to purchasing the home – this is not true. The Earnest Money Deposit becomes part of the down payment at closing. If the deposit is larger than the required mortgage down payment, the buyer will receive the balance at the closing. In conclusion, an Earnest Money Deposit is a way for a buyer to prove they are serious about following through with the purchase of a property. If you pay a higher Earnest Money Deposit, your offer will often look better to the seller. Remember – all of the earnest money will be applied to the down payment if the offer is accepted. That said, a buyer should consider putting an amount that’s equivalent to their required mortgage down payment. If the offer is rejected, the check will be returned to the buyer without being deposited. For more information on northern Indiana real estate (like Barrington Hills Homes for Sale) call the Julie Hall Group – Berkshire Hathaway Home Services at (574) 267-7501. Since 2008, the housing market has experienced a resurgence. Our group has witness this first hand by monitoring the number of Lake Wawasee homes for sale. For example, inventory is down and prices are up. But if you’re like most people, you want the process of selling your home to go over as smoothly and as quickly as possible. Unfortunately, there’s no way to ensure your home’s sale will go through without any headaches. Nevertheless, you can make the best of your experience by following several pointers (listed below) that will determine the outcome of your sale. Often times, selling your home can be one of the most stressful events a person can experience. There are several components that go into this process, and there are many issues that can affect the end result. When putting your home on the market, take into consideration our 7 Components of a Successful Home Sale. These will help you assess what areas of your home need work, and how you can positively influence a potential buyer to give your home more than a passing glance. The often cliché phrase, “location is everything,” isn’t necessarily true for a seller. In fact, cost seems to be the most influential component when potential buyers first come across your listing. In some ways, it’s all about the money. Despite owning a home in an area sought out for having the best schools and a vibrant community life, when it comes time to sell, your home will be overlooked by potential buyers for simply being out of their price range. Consider keeping your asking price slightly below any rival home sellers; this can help attract buyers and result in the quicker sale of your home. While cost overtakes neighborhood in our line up, it still remains an important aspect of the home selling process. For instance, if your home is located in an undesirable neighborhood, close to a freeway or the local jail, your home will not be as appealing as a home in a more secluded part of town. The more livable your neighborhood, the more you should boast about it when promoting your home. When selling your home, it is crucial that you remember that you aren’t the only one with your home on the market. Often times, the competition can be tough. You will find yourself up against present listings, foreclosures and even past sales. When determining your asking price, keep this in mind. What things do other homes on the market have that yours doesn’t? You’ll need to boast about all of the amenities your home has to offer versus other homes in a potential buyer’s price range. In what condition do you find your home? The market is full of potential buyers looking for all kinds of properties. However, given the current state of the real estate market, many buyers are not looking for a dilapidated old house in an excellent neighborhood. Potential buyers want a home they can move into. That said, it is important to ensure that you invest in having your carpets cleaned or have a fresh coat of paint added to the inside of your house. It is imperative for a potential buyer to have an excellent first impression of your home. To do this, keep your yard maintained and the exterior picked up on a regular basis. In addition to the exterior, which is the first impression anyone has of your home, the interior of your home should be equally pristine. You should want to show a potential buyer how your house can become their home. Believe it or not, but the kitchen is one of the most important things to a potential buyer. It’s where they’ll be cooking their Thanksgiving dinners, and where their families will be congregating each night for family meals. To increase your marketability, you should consider investing in updating your kitchen. If you already have a fabulous kitchen, be sure you promote how amazing it is. You don’t want to go through the process of selling your home alone; consider having an experienced real estate agent by your side who can guide you through the intricacies of the home selling process. A licensed agent has many tools at their side to help in this process. When promoting the sale of you home, you are no longer only focused on the immediate and surrounding communities. Due to the rise of the internet, it is now possible to promote the sale of your home to millions of potential buyers. A real estate agent can help put a concrete plan of action in place to ensure that your home will sell as quickly as possible. For more information, call the Julie Hall Group – Berkshire Hathaway Home Services at (800) 218-8195.